Through autoclave and freezer, no label is quite so tough as the mighty lab label. Where other labels would peel off, smudge or fade, lab labels remain affixed and legible, silent guardians of the samples they identify. If you're looking for such a label and you're not quite sure where to start, below you'll find quick overview of what you need to know (and a handy acronym to remember it by). Though there are many types of lab labels, there are a few elements they tend to have in common: Thermal Transfer Printing, Acrylic Adhesive, Resin Ribbons and Poly Labels. Or if chemistry hasn't made you totally sick of acronyms: TARP. There are two general types of label printers, thermal transfer and direct thermal. Thermal transfer printers require a type of ink called a ribbon, which is precisely why this is the printing choice for lab labels. Markings made with ribbons are much more durable than their direct thermal counterparts, and they allow for printing on a wider variety of label stock. Thermal transfer printers for lab labeling should have a resolution of at least 300 dpi. DPI (Dots Per Inch) determines print quality. For small labels, like those that would fit on vials, tissue cassettes and microscope slides, 300 dpi ensures that markings are crisp and clear. Though the labels may be legible to humans at a lower dpi, it is unlikely that a scanner will be able to reliably read barcoded data, which is why the higher resolution is important. Label adhesives come in two major varieties: rubber and acrylic. Unlike rubber, acrylic adhesive does not weaken over time. It is the best choice for long term labeling. Among acrylic adhesives, there are several different types. For lab labeling, permanent adhesive is a reliable choice. 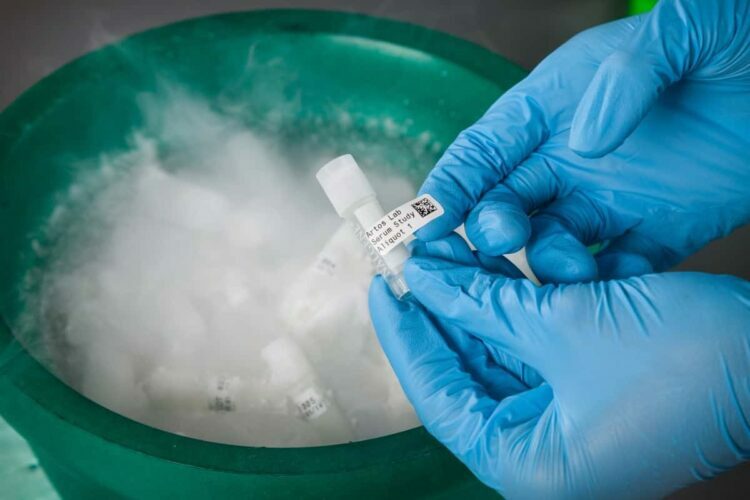 For cryovial labeling, some labels have a freezer-tested adhesive that will adhere in temperatures up to -40 degrees. Ribbons are the “ink” of the thermal transfer labeling. Ribbons come in three types, wax, resin and a wax-resin mix. Markings from wax ribbons will degrade quickly in most lab environments, so a resin ribbon is recommended for most lab applications. Note that not every ribbon works with every label. If you’re unsure, reach out to the manufacturer as they will be able to verify compatibility. Synthetic labels - specifically polyester and polypropylene - work best for harsh environments where they may be exposed to chemicals, moisture or abrasion. They show extremely high durability in freezers, autoclaves, liquid nitrogen and the slide staining processes. Each element in TARP serves an important purpose in the durability of a lab label. Substitutions will make your lab label less effective at best. At worst, it may mean that you've wasted time and money on a solution that simply won't work. It's best to stick to what's tried and tested, especially before you discuss possible changes with your supplier. Choosing a new label solution is tough, especially when patient safety is on the line. If you’d like to talk through your solution with a label expert, we’re always happy to chat.